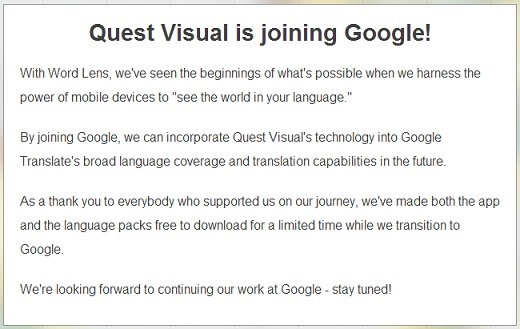 According to a statement on its website, Quest Visual, the company behind the highly-regarded live translation app Word Lens, has been purchased by Google. This news has ripple effects across both the Android and iOS platforms, as it is likely Word Lens will be discontinued in the near future in favor of incorporating the technology into Google's own Translate app. For now, however, Quest Visual has made all Word Lens language packs available for free in celebration of their new deal with Google. This means that the acclaimed live word translation service is available to any Android, iOS, or Google Glass users out there. Just head on over to the iOS App Store, Google Play, or your MyGlass app to install Word Lens, and any language that the service supports will be available to you, free of charge. This is fantastic, I saw this when going over to Holland for a holiday, but unfortunately they do not support Dutch (or did not at the time) but now that its free I'm just gonna use it for showing to friends.